From sports teams to grocery stores to construction companies, here are the kinds of Seattle businesses that will likely face the head tax. Ninety-nine wholesalers, 87 professional, scientific and technical services firms, 78 construction companies and 77 retailers are among the estimated 585 businesses subject to Seattle’s new head tax. These businesses and dozens more had at least $20 million in 2016 revenue in the city of Seattle. That’s the revenue threshold set for the $275-per-employee annual tax, passed unanimously by the Seattle City Council on Monday afternoon. Read the list of businesses with at least $20 million in 2016 revenue in Seattle, by industry, here. The city’s list, obtained by The Seattle Times through a public records request, is broken down by economic sectors and subsectors rather than naming individual companies, in deference to taxpayer-confidentiality rules. But it provides the most detail yet on the types of companies that will pay the new tax, set to begin next year. The tax will be based on 2018 revenue. The list is compiled using city business-and-occupation tax data from 2016, so the actual number of companies subject to the tax may differ from the 585 on the list. Amazon, the company expected to pay the most under the tax, likely falls in the category of “nonstore retailers” — one of six such businesses on the list. The list also includes seven hospitals and 19 “ambulatory health-care services providers,” but at least some of these businesses were exempted through an amendment to the ordinance passed Monday. Councilmember Sally Bagshaw, who introduced the amendment, argued that it levels the playing field for health-care providers such as the Polyclinic — which would have paid $350,000 to $400,000 a year, imperiling its provision of up to $1 million a year in charity care, she said — that compete with already-exempted nonprofit hospitals and health systems. Grocery stores may be among the hardest hit by the tax. They have significant revenue — at least 11 food and beverage retailers are on the list — and lots of employees but some of the thinnest profit margins around. The Seattle Times would likely be subject to the tax, company president Alan Fisco said last week. 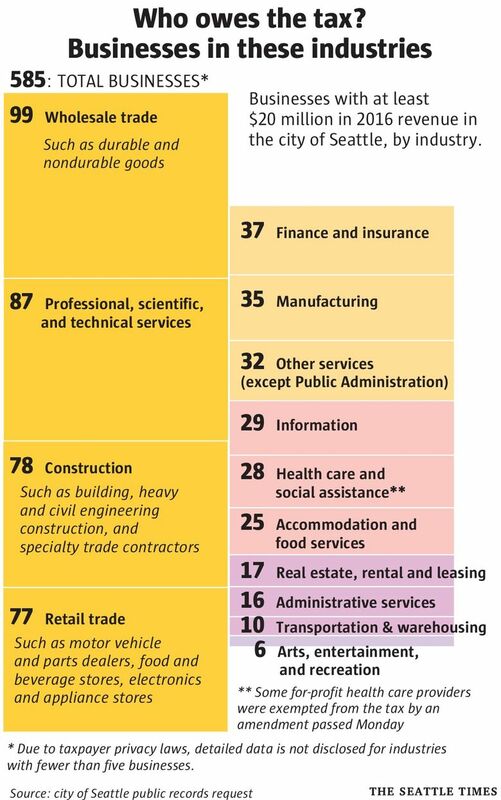 Other subsectors with substantial numbers of companies expected to be on the hook for the tax include personal and laundry services (28), food service and drinking places (14), real estate (13), accommodations (11), and performing arts, sports teams and related businesses (5).